Easy Classic Lemon Curd: So easy to make, this simultaneously sweet and mouth-puckeringly tart lemon curd sauce is the perfect topping for cheesecake, ice cream and sponge cake. Layer in parfaits or between cake layers. Or just grab your spoon! This simple recipe uses four fresh ingredients you probably already have on hand: lemons, butter, sugar and eggs. True confession. If you’d mentioned ingesting Lemon Curd when I was a kid I probably would’ve freaked out. Remember Little Miss Muffet who sat on her tuffet, eating her curds and whey? Friends, lemon curd is most decidedly NOT Purina Cat Chow. Curds are actually just the soft, white substance formed when milk sours, often used to make cheese. And classic Lemon Curd is one of the creamiest most delightful culinary creations ever. Great as a fruit dip, layered in parfaits, slathered between cake layers, or as an ice cream or cheesecake topping. Try dipping my Gingersnaps in them….utter bliss! This easy version from Southern Living includes both a microwave and stove-top version, your choice. Cooks for a measly 5-7 minutes in the microwave or 14-16 minutes on the stove-top. 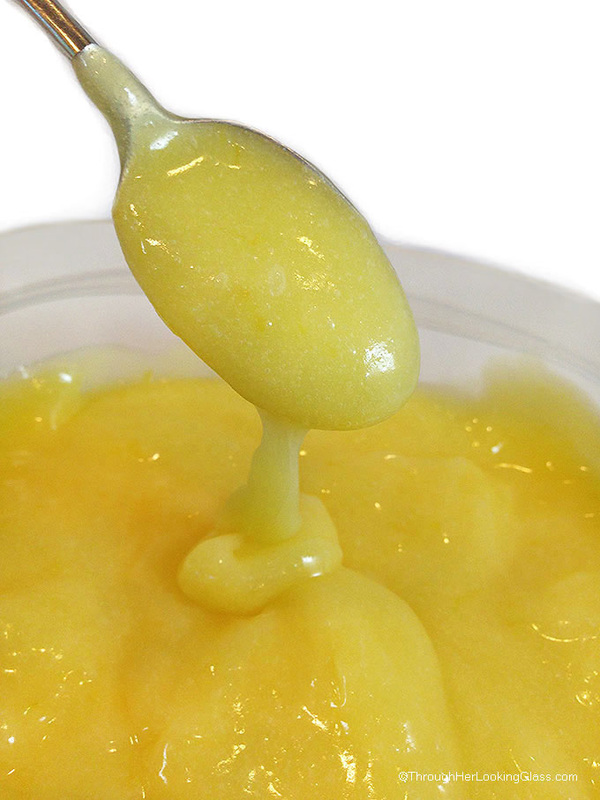 Classic Lemon Curd: simultaneously sweet and mouth-puckeringly tart. Eggs, lemon juice, sugar and pure butter combine to silky smooth perfection. 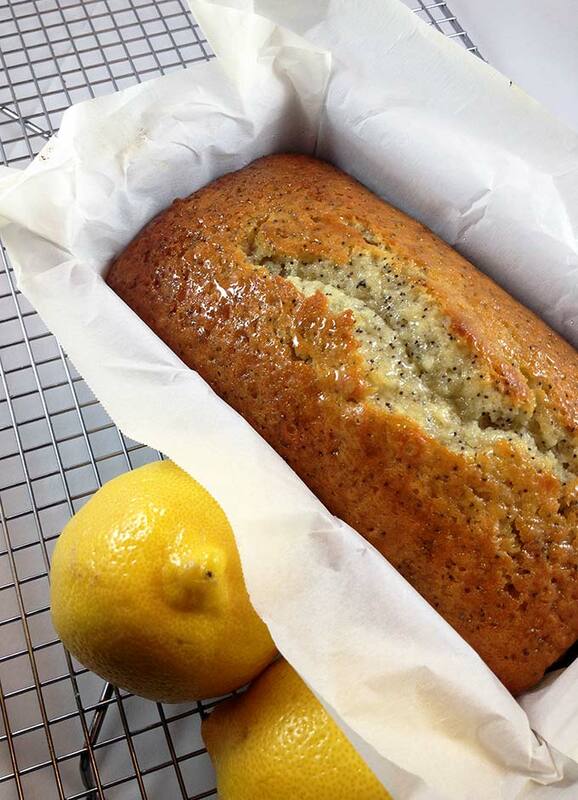 Grate enough zest from lemons to get 2 tablespoons. Squeeze lemons 'til you get the 1 cup needed. Separately, in a microwave proof bowl, beat butter and sugar with an electric mixer 'til blended. Beat in eggs, 1 at a time, blending just until incorporated. Slowly add lemon juice, beating at low speed until blended. Microwave at high for 5 minutes, stirring once every minute. Then microwave a little longer, stirring at 30 second intervals, just for 1-2 more minutes. Lemon curd will thicken and coat the back of a spoon, and start to mound slightly. Cover warm curd with plastic wrap directly on it (to prevent a film from forming). Chill a minimum of four hours or 'til firm. Refrigerate in airtight container for up to 2 weeks. Cook in a heavy saucepan over medium heat. Whisk continuously for 14-16 minutes. "Friends, lemon curd is most decidedly NOT Purina Cat Chow." Hahaha! Too funny! Isn't it something the things we think in our mind's as kids? Well, I'm glad you got past thinking it was cat food. This sounds delicious! I haven't ever thought of something like that as a cheesecake topping...YUM! i, too, thought lemon curd sounded yucky . . . Until I had it at Farmer's Hall in Pendleton. I was hooked! Tina, did I ever go to Farmer's Hall in Pendleton with you? It sounds like a delicious place we might have visited together once upon a time. I'm not sure, but I think we did lunch there once. Chip and I would always go for our anniversary dinner! Oh Allie, I am so glad you shared this. I used a package lemon curd for my berry trifle, because I did not know how to make my own. This is perfect. Mmmmm- looks soooo good - can't wait to try it! The first time I had this was at Bill and Beth Welborn's home probably 20 years ago. It is delicious! Sounds exactly like something Beth would serve out of her kitchen! I have never tried making lemon curd but given how much everyone loves to cook with lemons around here, it's probably time I start! Thanks for the recipe! I truly don't care what Lemon Curd is made from because I absolutely LOVE it! Allie - you scored big again. This recipe looks delicious. I love how simple ingredients can come together into something so delicious! Great idea to dip gingersnaps into lemon curd - yum! My last batch was a disaster, so I'm happy to have your easy version on hand - thanks! I LOVE lemon curd but I agree, such a weird name. Young me would not have eaten it either. I just love lemon curd! When I was in high school I attended and international school for a year and on of my British friends would have me over for tea, and we almost always had scone and lemon curd. This is a food that brings back wonderful memories! That settles it. I need to make scones and lemon curd this morning. I'll pack them for our trip this weekend because homemade scones and lemon curd sound much better than hotel breakfast. I'm all for quick recipes, and this looks delicious! Haha - love the logic of your kid self, Allie! I gotta admit, my kid self and your kid self sure would have gotten along real well because I avoided every and all "curds" like they were the plague - just because of that darn nursery rhyme! Now that I am older and wiser (debated by some) I love lemon curd - but I've never made it - think I should change that? Hope you and your family has a wonderful weekend, dear. I love lemon curd, but have yet to make it. I better change that! Lemon desserts are my favorite. 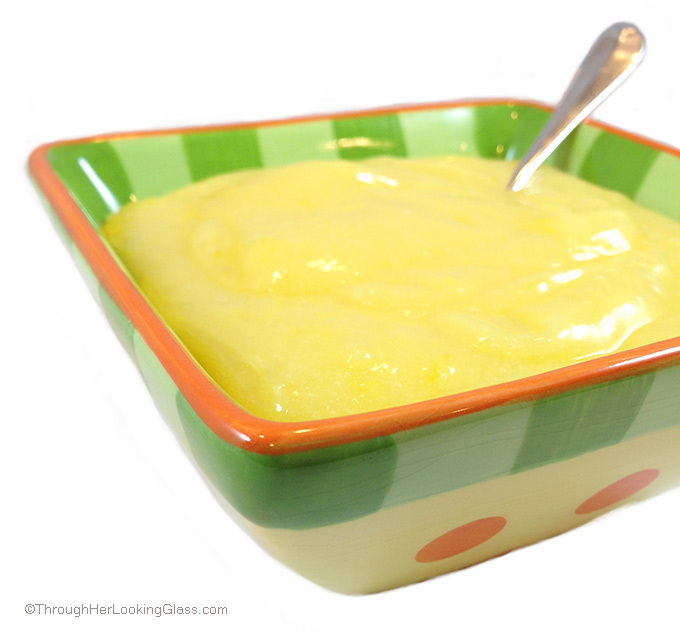 I love lemon curd and have made it before but not for a long time. I have a bunch of goat milk to use up so maybe I'll make some yogurt and try lemon curd on it. Lol, I used to think curd was some nasty animal food too! 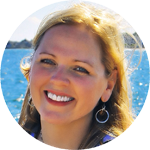 So I totally love your little miss muffett comment!! 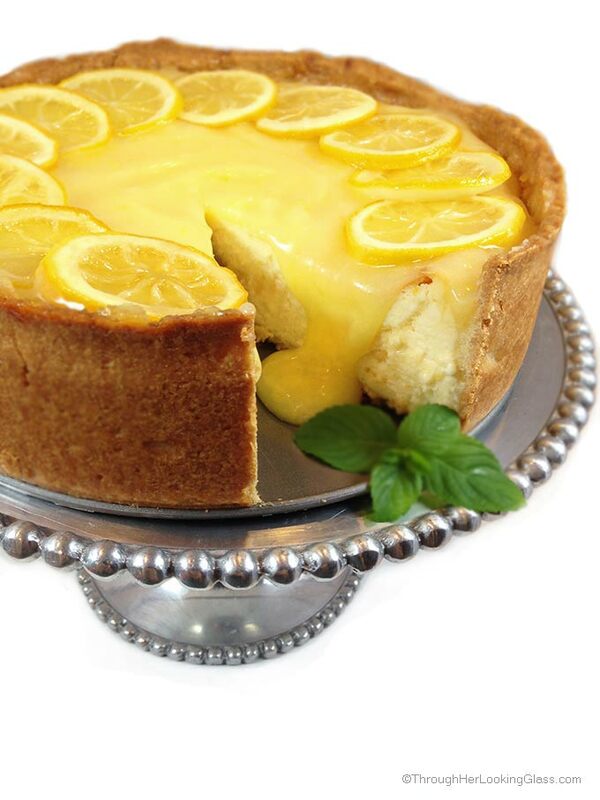 This lemon curd looks sensational! That last shot of it on the pie of pie gave me a "OMG, NEED!" moment!! Love how easy this is, Allie! Pinned! Cheers to a fantastic weekend, girlfriend! I don't know if I have ever tried lemon curds. Judging by the mouth-watering pictures, I probably should!! xo Have a wonderful weekend, Allie. Je suis d'accord avec toi, quand j'étais petite, surement je n'aurais pas aimé le lemon curd, alors que maintenant j'adore!! Ta tarte est terrific! Cat food, lol! I wouldn't eat yogurt when I was younger after I read "live and active cultures" on the tub. So silly! Anyway, I am making a pound cake tomorrow for a friends birthday and instead of icing, I am going to make your Lemon Cream with Lemon Curd. Looks delish!! Hi, a great recipe! One ques, Anything which we can use to replace eggs? Possible?? Hi Sakshi, not sure what you would use to replace eggs in lemon curd. Eggs are the thickening agent in this recipe and one of the main ingredients. But if I get a brainstorm, I'll let you know! I'm with you on the cat food thing--I've long thought that "curd" should be called something else because it's not a lovely enough name for something so delicious :). This looks awesome. I love how quick it is! Have a great weekend, Allie! Allie - I have yet to make this lemon curd (it's bookmarked from the first time you shared it) am thinking at this point am gonna have to have y'all come over when the sale of your house goes through and y'all are waiting to close on your next one and make me ALL the Lemon curd ma belly can hold - deal?! Hoping everything goes better than planned on the 14th of June! Love the simplicity of this recipe! 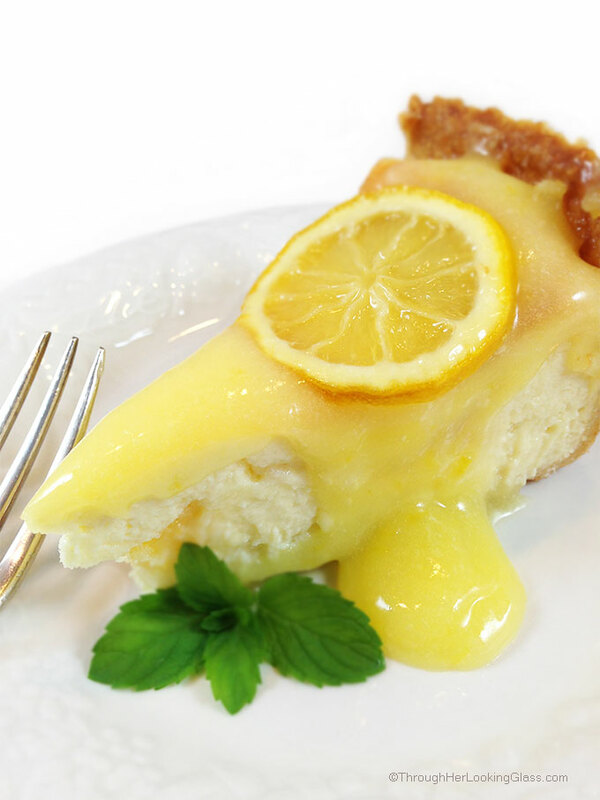 Lemon curd is so delicious, and the versatility is an added bonus! Luci’s Morsels | fashion. food. frivolity. Yummy! Such a delicious and finger-licking treat, Allie! Can't wait to give it a try! Im a sucker for lemon curd! Dear Heikki - You are exactly the kind of person I need in my life! Thank you. And this is a perfect example of why one (me!) should not edit posts past my bedtime. Yes you are correct - Miss Muffet was from Mother Goose!!! Ha ha. Thanks for setting me straight - apparently I'm easily confused by my childhood memories! :) I will correct that in my post. I've made that fabulous cheesecake, too! I love, love lemon curd, and don't know why I don't make it more often! !